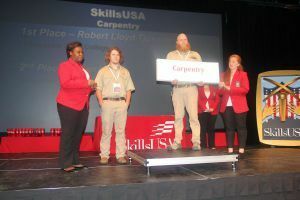 Pensacola State’s SkillsUSA chapter has done it again! Eleven members of the college’s team won gold and silver medals in five categories at the 2017 Florida State Leadership and Skills Conference held April 24 through 25 in Lakeland. 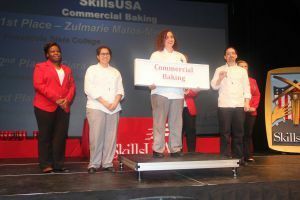 They advanced to the national competition set for June 19 through 23 in Louisville, Kentucky. SkillsUSA is a national organization with more than 13,000 chapters, which serves more than 300,000 student-members and instructors each year. The organization improves the quality of America’s skilled workforce through a structured program of citizenship, leadership, employability, technical and professional skills training. Headed to the 53rd Annual National Leadership and Skills Conference are Shatori Brokington, Samantha Dudley, Nicole Floyd, Robert Lloyd Tjossem, Selena Arnold, Tia Henry, Elizabeth Bradford, Candis D’Ann Calvert, Meredith Juli Golden, Morgan Lundquist and Kareena Manassa. The student-members will be joined by SkillsUSA advisors – Tony Grahame, Sonja McCall-Strehlow and Mary Turner. Pensacola State President Ed Meadows is proud of the SkillsUSA student-members and their accomplishments. 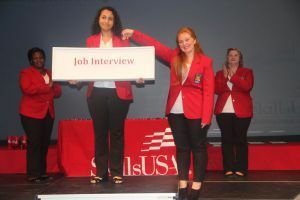 Jennifer Ponson, Region 1 SkillsUSA director and Pensacola State coordinator of Student and Program Outreach, described the college’s delegation as the best of the best. In 2016, the Pensacola State chapter was one of only two community colleges in the nation to receive the Models of Excellence Award at the national conference. In December, Lowe’s presented the chapter ─ a 2016 SkillsUSA National Models of Excellence Recipient ─ with a $2,000 grant. The award is the highest level of the SkillsUSA Chapter Excellence Program and included the grant.